In Focus: PIAAC in Canada – What is the role of education in developing literacy and numeracy skills in the territories? Where do Canada's northern territories stand when it comes to proficiency in literacy and numeracy skills? The Programme for the International Assessment of Adult Competencies (PIAAC) goes a long way toward answering that question. Although previous studies have examined the determinants of literacy and numeracy of different groups within Canada, very few have specifically analyzed the populations of the country's northern territories — Yukon, Northwest Territories, and Nunavut. Here we look at literacy and numeracy results for the region, with the aim of identifying the key factors contributing to the development of these skills. This volume reports results from the 24 countries and regions that participated in the first round of the survey in 2011-12 (first published in OECD Skills Outlook 2013: First Results from the Survey of Adult Skills) and from the nine additional countries that participated in the second round in 2014-15 (Chile, Greece, Indonesia [Jakarta], Israel, Lithuania, New Zealand, Singapore, Slovenia and Turkey). It describes adults' proficiency in the three information-processing skills assessed, and examines how skills proficiency is related to labour market and social outcomes. 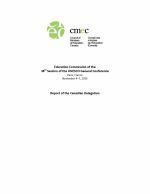 This toolkit was envisioned by the education and provincial-territorial labour market Ministers at the Skills for the Future Symposium in July 2014, held in a response to a request from premiers through the Council of the Federation. The toolkit is an opportunity for sharing promising practices amongst provinces and territories and with the many stakeholders leading and supporting our education, training and employment programs.